In 1974, Jean Kennedy-Smith, a sibling of President John F. Kennedy, founded Very Special Arts (VSA) with the vision of bringing arts to people with disabilities across the country. Since then we have witnessed the establishment of VSA state chapters, the passage of the Americans with Disabilities Act in 1990, and technological advancements—all of which have furthered Kennedy’s vision. However, there is more work to be done on a local level. The Lehigh Valley Arts Council recently launched a Pennsylvania Arts Access Program, which seeks to ensure that everyone in the Lehigh Valley has access to a rich, diverse arts culture. For our blind and deaf arts patrons, it can be as simple as providing them with audio description and open captioning equipment and an enlightened box office staff or volunteers. I was fortunate to become one of these volunteers on October 25th and 26th when I took a training session and discovered how audio description can really open the door to a deeper experience. Audio Description assists patrons who are blind/low-vision to access the visual elements of museum exhibits and stage productions through narration provided by trained describers. Patrons use headsets to hear the audio description. 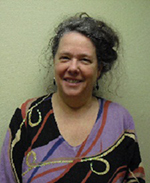 Our trainer was Celia Hughes, Executive Director of VSA Texas and a seasoned describer for more than two decades. She introduced the class to the foundational skills—Observe, Analyze and Communicate— necessary to audio describe a play. She made me aware of the reality of a blind patron and taught me how to observe art more closely. Hughes stressed basic concepts to consider as we trained. She reminded us that very few people are totally blind. “Some have light perception or limited sight. Describe the important or key elements of the thing that you are observing and do it in an orderly way. They are building an image in their mind of what you are describing and you need to not overload them with information, and to not confuse them by skipping around in a haphazard manner.” She suggested that we try to use analogies to things that the listener may have knowledge of, or describe in relation to things that they may have experience with. Also, it is important to keep your description simple. We began our training by practicing the core skill of observation, using scenes from plays on film as examples. For instance, we described in detail the environment of The Gin Game, including the furniture placement, the time period, the location and the time of day. Hughes suggested that whenever possible, a tactile tour is recommended before the performance where patrons are able to touch the props, costumes, and furniture, as well as sometimes meet the cast. Analyzing your observations means considering the production’s bigger picture—how the different visual elements are reflected in the theme and tone of the production. First and foremost, read the play beforehand and attend at least one rehearsal. Before the curtain rises, describers will read the director or dramaturge’s notes to help put the production in a context for the patron. A describer’s job is not to interpret but to provide a description that allows the blind patron equal access to the world of the play and their own interpretation. The final step involves communicating the action on stage to the patron, by speaking to the listener through a wireless microphone from the stage managers booth as the play progresses. This proved particularly tricky during the training—you had to be careful not to talk during a performer’s lines, control your volume, and describe quickly and smoothly; it was quite a challenge. At the end of the first day, our training group was treated to Muhlenberg College’s wonderful performance of “The Mystery of Edwin Drood,” audio described by local describer Nicole Sardella. Of course, one two-day training session did not make me ready to tackle the job on my own. Over the next few months, trainees like myself, will have the opportunity to hone their skills by working with a mentor and gradually gain practice. The Lehigh Valley Arts Council seeks to train a corps of audio describers in the region to encourage cultural groups to offer the service on a regular basis, and thereby, increase attendance to their events. The equipment that the Arts Council purchased is available for shared use by the nonprofit cultural community. However, the bigger picture is the 2015 celebration of the 25th anniversary of the passage of the Americans with Disabilities Act through the lens of the arts. The Arts Council is working with the Partnership for a Disability Friendly Community to create this event throughout the Lehigh Valley. On November 21st, the Arts Council hosted START ACCESS NOW a community discussion on accessibility. Featured guest Ms. Betty Siegel, Esquire, Director of VSA and Accessibility at the John F. Kennedy Center for the Performing Arts, spoke to members of the arts, social service and health service sectors about ADA compliance. Her presentation emphasized the importance of embracing accessibility as a community asset and a core value of customer service. “The ability of all participants to participate fully should be adopted as a core value.” At the end of her presentation, attendees were invited to become involved with planning the 2015 celebration. The Lehigh Valley Arts Council will continue to offer workshops, trainings and discussions on accessibility as it works to make the Lehigh Valley more inclusive. Resources exist to support organizations in becoming more accessible. Visit our new Arts Access program page for updates and more information, including Betty Siegel’s presentation and Celia Hughes’ notes for organizations on starting an Audio Description program. The next accessible performance in the Lehigh Valley is The Trial of Ebenezer Scrooge on Saturday, December 7, 2013, at 2PM at Act 1, DeSales University Theatre, Center Valley.